For some reason the wall color reads correctly in the larger version, and in the above smaller version, the color is too intense. The smaller it is, the more saturated the color. And the last wall to photograph in my bedroom. Now that the sun has returned, I’m photographing portions of my house that hadn’t been shot before. And tomorrow, I hope there will be at least an hour of quality morning light to photograph the newly installed front garden. All of these shots are needed to complete my redesigned website. The details are driving me crazy with endless hours of photoshopping and uploading, and I have yet to write the copy. Most of this work occurs at night, since my day hours have been monopolized with real work and continual domestic problems that need fixing. I absolutely adore your whole house. This is beautiful. 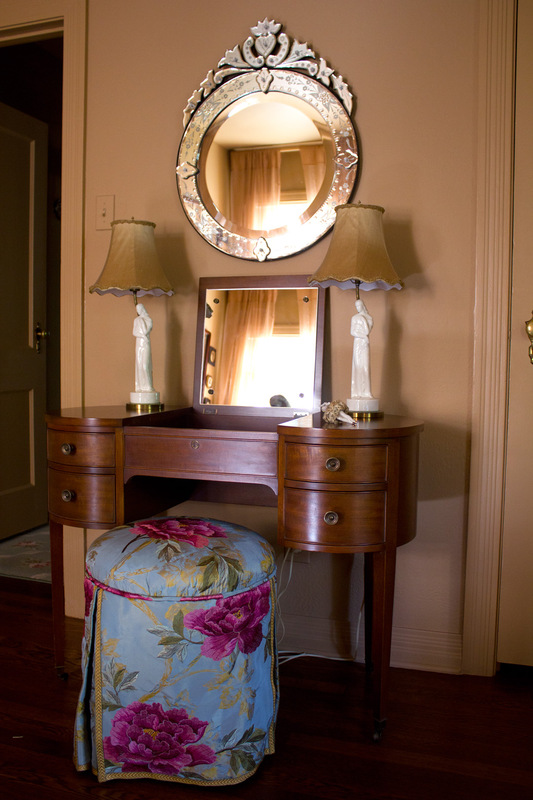 I would like to see what goes in the top space of the dressing table. Becky, what I have in there is just temporary. I have one idea which would be to line it with some crazy jewelled fabric, but I just haven’t had the time to follow through.